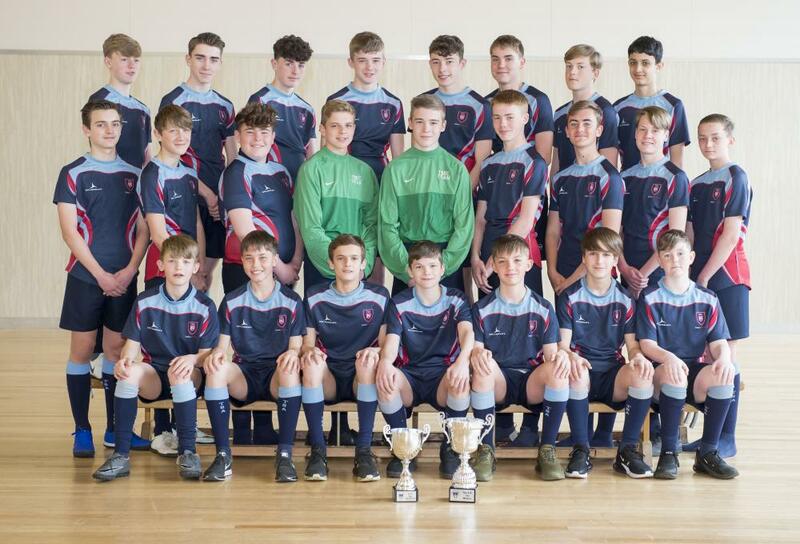 Tollbar Academy's Year 9 'A' and 'B' Teams, who won their respective games at the Humberside Schools County Cup Finals against St Mary's College, Hull. The 'A' team are now Schools Champions for the second year running. Tollbar Academy's Year 9 Football 'A' Team has won the Humberside Schools County Cup for the second year running. The event took place at St Mary's College, Hull, with Tollbar beating them 3-2 in a re-run of last year's match. Man of the Match Brooklyn Dennis scored a last minute winner for Tollbar Academy. Not to be outdone, Tollbar Academy's Year 9 'B' Team, did the double, beating St Mary's College 'B' Team 3-1 to take the 'B' Team trophy. Tollbar's 'A' Team made a positive start to their match and had an opportunity to take the lead when Lucas Meredith was put through on goal, only to have his shot saved by the goalkeeper. From the resulting counter attack, the St Mary's number 9 dribbled past a couple of players and scored. Tollbar responded well to going behind and forced a series of corners. From one of the corners, Henry Moore managed to head the ball towards goal, however, a St Mary's defender blatantly handled the ball on the line and the referee had no other option than to award a penalty kick to Tollbar. Brooklyn Dennis stepped up confidently, striking the ball into the net, whilst sending the goalkeeper the wrong way. Half time score: Tollbar 1, St Mary's College 1. With a slight tactical change at half time, Tollbar started the second period on the front foot and pressed from the off. Kobe Towill, Ben Leggett and Brooklyn Dennis were causing havoc for the St Mary's defenders, and it was only a matter of time before Tollbar took the lead. The goal came soon after from Ben Leggett, he dribbled passed a couple of players before producing a sublime finish to send Tollbar 2–1 up. Tollbar continued to push forward in search of a third and decisive goal, but it was St Mary's who managed to claw their way back into the game and gained an equaliser with 10 minutes left of the game. A quick break forward from the St Mary's number 9 ended up being smashed home, giving Declyn Dennis no chance in the Tollbar goal. Into the final 10 minutes, and the match was very well-balanced with both teams trying their hardest to get a winner. Going into the final minute of the game, Sam Wilkinson (Tollbar Academy) picked the ball up in the St Mary's half, dribbled past a couple of defenders before unleashing a thunderbolt. The St Mary's goalkeeper did well to save the initial shot, however, he only managed to parry the ball into the path of Brooklyn Dennis, who bundled the ball home for his second goal of the game, which sparked huge celebrations amongst the Tollbar Academy players. Man of the match: Every Tollbar Academy player was superb on the day and worthy of the accolade. However, the man of the match award goes to Brooklyn Dennis for an excellent performance throughout, topping it off by scoring two vital goals. A promising start from a well organised and determined Tollbar 'B' team pressed home an early advantage, when Harry Telford hit the back of the net 10 minutes into what was a game to remember. Captain, Daniel Mcdougall controlled the back four, which prevented early chances from St Mary's. Scott Bingley also played a very solid game saving and blocking numerous shots. A sudden break, however, by St Mary's and a defensive error by Tollbar, led to them equalising just before half time. Levelling the score line. A good half time talk and some strategic changes seemed to buoy up the Tollbar team. This led to Alfie Handley slotting home an impressive goal giving Tollbar that important 2-1 lead. Tollbar moved the ball a lot quicker and in particular the fast footwork of Brett Gladding, and the work rate of Gabrielle Woods pressed the opposition at every opportunity, which eventually led to another Harry Telford goal. Overall an impressive performance by the team and a final score of 3-1 to Tollbar.